My husband and I recently marked our first wedding anniversary, and Casa Alegria played a big part in our celebration. 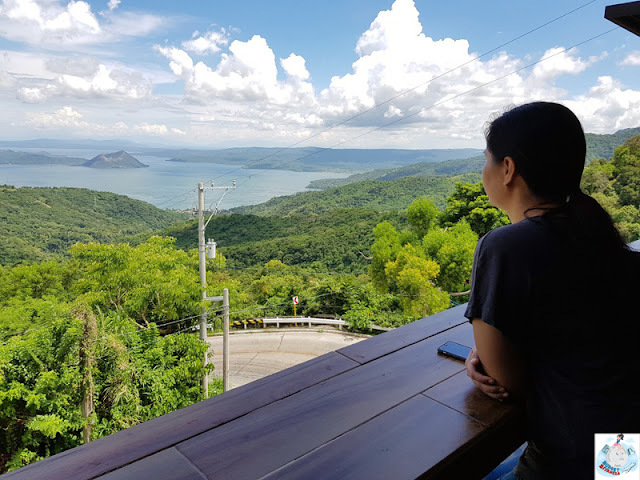 Choosing to celebrate our special day in Tagaytay was a great choice because not only was it a short drive from Manila, it also offered one of the most romantic views in the Philippines. 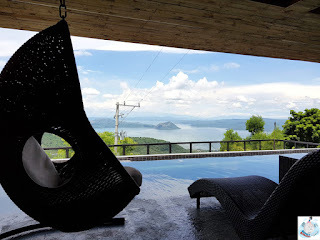 I specifically loved the Bed & Breakfast, as it presented a panoramic view of the stunning Taal Lake straight from our window. Being able to wake up to such a gorgeous vista, with the love of my life beside me, was simply the best of both worlds. There’s plenty to love about Casa Alegria, but allow me to write about the cons first, before I share our praises. First off, the B&B wasn’t hard to locate. But it gave my husband some difficulty while driving to the property, as it was a downhill drive with three sharp curves to boot! Also, the uphill drive gave our Revo quite a struggle. Sadly, these were the reasons why we rarely left the boutique lodging. We’ve also read the bad reviews about Casa Alegria, so that made us worry prior to our trip. The saddening stories really made me want to back out at the last minute. But my husband urged me not to. He said that if things did turn out bad, then we could always leave and look for another place. Of course, I didn't want to ruin our weekend getaway, so I gave it a chance. And as soon as we settled into the B&B, we were able to validate some of the complaints, which to us, were actually quite manageable. 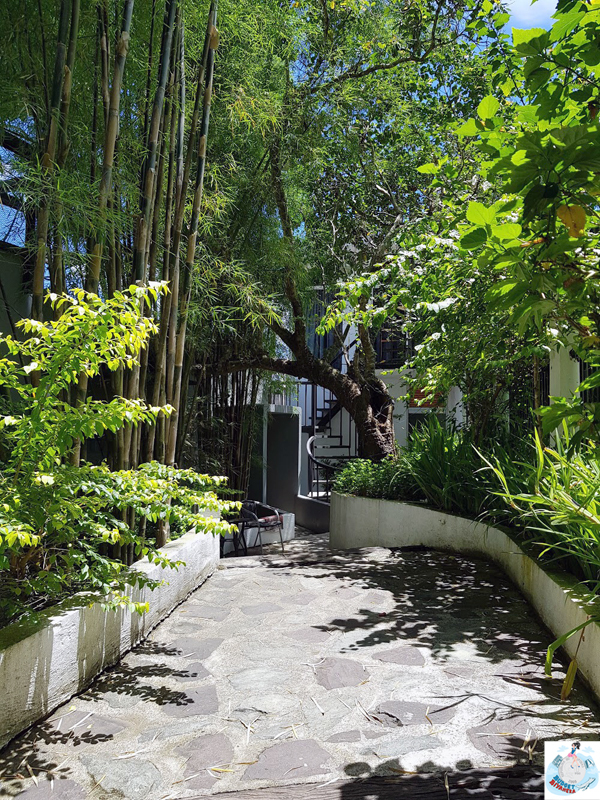 We’ve managed to have a chat with the manager of Casa Alegria, Ms. Che, who shared that guests’ complaints were acknowledged and addressed at the soonest possible time. She said that some of their clients might have felt like the phone was dropped on them or their calls weren’t being answered. Well, to be honest, the signal uphill really kept breaking up (I tried calling to Yellow Cab), so I could attest to the choppy reception. I asked the B&B if they had a landline that I could borrow and call from. But they had none, unfortunately. But the manager said that they‘ve already requested for a connection from PLDT. So hopefully, they'd be granted a unit soon. There were also complaints about the water supply (from having a low reserve to having none at all). We were able to experience having no water one morning. But they were able to resolve it a few minutes after informing them (they only had to open the tank's valve). 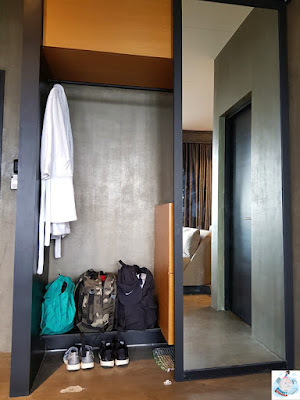 We were also informed that each room had its own water tank, and that they also had a schedule for when the water flows in their area (every Tuesday, Thursday and Saturday). They also have tanks allotted for every room, with a ready supply, in case they ran out on days when they have no water ration. Of course, their uphill setting was one to be considered too, which somewhat added to this roadblock. Hopefully, this water situation gets resolved soon. Many have also complained about the “small creatures” that were seen crawling or flying in the area. My husband and I already saw some flies and spiders within the B&B that were bigger (in size) than usual. But the spiders that we saw were definitely not Tarantulas, as these air-breathing arthropods spun their own webs and weren’t hairy. Now, I wouldn’t lie about not getting scared when I saw some of these beings around. But my husband assured me, as well as the staff members, that these weren’t poisonous. 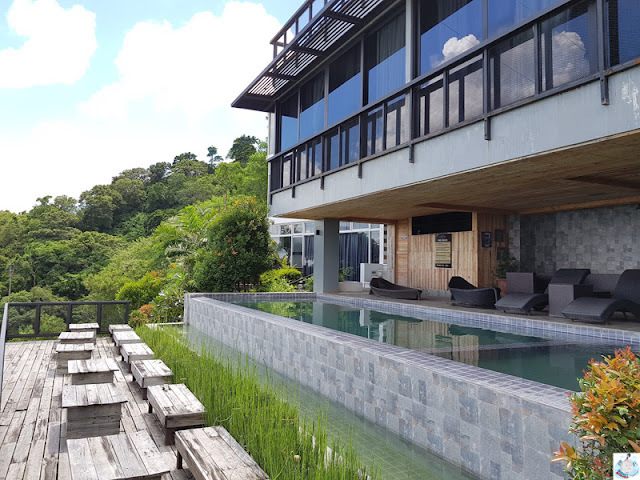 We were able to manage our expectations concerning these creatures because it was already evident that Casa Alegria was built on a forest-like setting. The lodging, where an abundant ecosystem thrives, was surrounded with trees and foliage. And to remove these organisms from their natural habitat using pest control would be just cruel. So what did we do? We co-existed. Our experience was actually quite tolerable given the environment we were amidst in. We also heard not so-good comments about a much-needed maintenance for the property, particularly on the rooms. But we couldn’t comment on this, as our room looked perfectly fine. But the manager was able to impart to us that renovations were already scheduled for June. They couldn’t have the B&B fixed sooner because they were always fully booked. Given the surroundings, where trees and plants were found all around, we would sometimes find small insects floating on the water (surprising at times, but wasn't that bothersome). Also, some of the tiles were already chipped, which should be fixed immediately, so that guests can avoid getting unnecessary cuts. The staff, on the other hand, was all nice and accommodating. But they were obviously understaffed (I think they were just 6 or 7 in total). They could definitely use more helpers in Casa Alegria, especially when it comes to doing the laundry and attending to guest's requests and utility checks. We also have a comment on the food costs, as they had a 10% service charge with an additional 12% VAT. We know it's part of the law to implement such charges. But our bill was so heavy on the wallet. And since it was a bit of a challenge to leave the B&B every time we got hungry (the drive uphill always proved difficult for my husband given how steep and narrow the road was), we’d be left with no choice but to dine in the restaurant. Good thing the Garlic Fried Rice and the Lechon Kawali that we ordered for lunch was crunchy and tasty, and that Kuya Chef was always all-smiles when serving our food. Now, they weren’t all that bad, right? Some of the scenarios in Casa Alegria were quite minor and manageable to us. But while there were problems, there were also some nice things that we experienced while staying at the bed and breakfast. 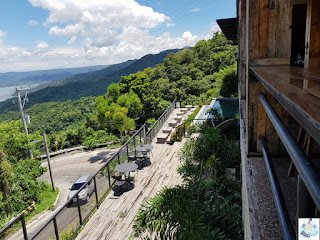 I wrote earlier that Casa Alegria wasn’t hard to find [Look for HOW TO REACH CASA ALEGRIA below], as the lodging was just a 10-12 minute drive to Tagaytay City proper (if there’s no traffic). You can also park your car inside the lot, as 2 vehicles can fit by the main entrance, 2-3 more on the roadside, and 3-4 by the gated parking lot down the hill. The charming part about Casa Alegria was that it offered a gorgeous view of its surroundings. But for us, the best part of our vacation was staying in the King Suite Room. The King Suite's windows opened up to a great view of the Taal Lake, which was stunning at every angle. We definitely loved waking up to such a glorious sight. We also loved the different elements that were integrated into the room's depths, which included cement and wood. Even the choices of paint that were used on the walls exuded a somewhat refreshing and cooling effect (black over browns and greys). The interiors, which displayed a modern chic and classy look, was definitely well thought out. Our King-size bed was comfy, the pillows (there were like 9 different sizes!) were divine and plush, and the duvet was thick and soft. We also liked that a sofa was furnished in the room, as we got to use it while watching TV. 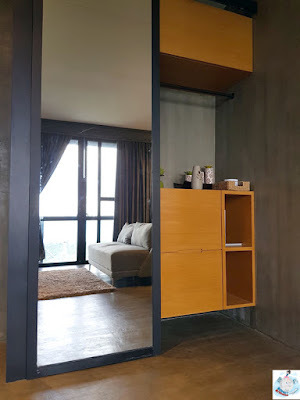 Our suite also had a floor-to-ceiling sliding mirror door, that when you slide to the left, opens up to two wooden drawers and a well-decorated shelf. It also opens up to more storage space when you slide the door to the right. Now, it didn't just provide function. It also added to the room’s overall visual appeal. We also liked that the A/C worked perfectly and was easy to adjust, and that the room was provided with ample lights. 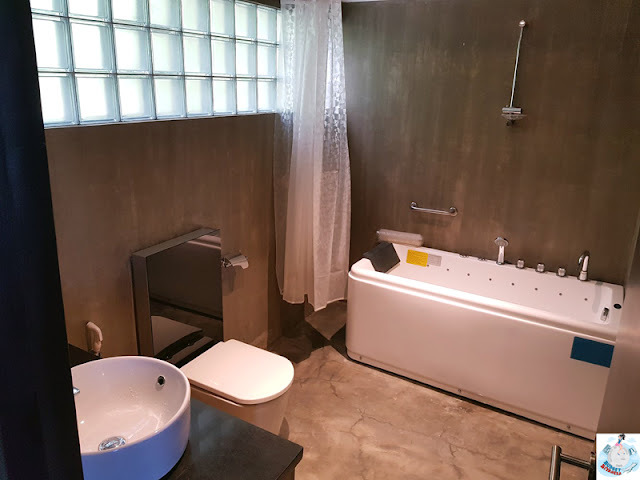 The bathroom was also world-class, as it highlighted state-of-the-art furnishings and more (i.e. bathtub had lots of nozzles, toilet had unique handles). 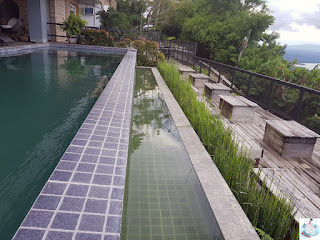 Of course, let’s not forget the gorgeous view that the Infinity pool provided -– the pool that had many guests smitten with. Its blue tiles simply resembled the ocean floor, making it look more calming while exuding a luxurious feel. While it wasn't the heated kind, the swimming pool still provided us with a nice soak. 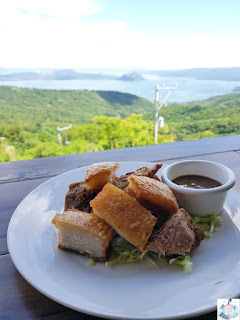 We also enjoyed hanging out on the roof deck, as it offered a panoramic view of Taal Lake. It was so peaceful and quiet there, that I could meditate under the trees without bother. Some of the guests have actually eaten their meals here because the view was just spectacular. The staff of Casa Alegria is one to commend, as each and every one of them was nice and accommodating. They made sure that they would always greet their guests at anytime of the day. And no matter how understaffed they were, they would always do their best to assist us in our every need and request. [Here’s a shout out to Kuya Racs and Kuya Chef for being the all-around guys during our stay last June 2-4!]. We definitely loved the food at Casa Alegria. We may have only ordered one dish (Lechon Kawali). But we were still pleased with the complimentary breakfast that they served to us, which were always prepared hot and fresh. Best of all, we enjoyed having our meals by the in-house restaurant, where the view of Taal Lake was present all day long. We think that the complaints can be lessened if all of the guests were completely informed beforehand (i.e. via email, via website, via booking sites). In this way, expectations can be managed at some point. Now, we know that the staff members always brief their guests before check-in. But there can still be a tendency to leave out other important matters. Therefore, we'd like to recommend (speaking as guests with onhand experience) for Casa Alegria to place printed notes inside the room. Providing the guests with the proper 'heads-up' -- particularly on the situations concerning water supply, insects, and maintenance -- can be an effective solution. We'd also like to suggest for a communication system to be implemented, such as placing a call button or an intercom inside per room. With one present, guests would no longer need to leave their chambers just to ask for assistance. We experienced this firsthand when we needed help closing the huge curtains (it got stuck somewhere) and when we ran out of water one morning. But since there was no phone around, my husband had to go all the way to the office, and ask Kuya Racs for help. Enter the Manila–Cavite Expressway (CAVITEX). 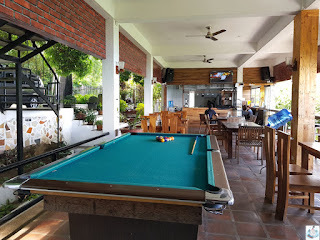 Drive towards General Emilio Aguinaldo Highway (the main rotunda of Tagaytay City), and look for Ligaya Drive located in front of Tagaytay Elementary School. Keep going straight and you will pass by Balai Taal. When you reach Sungay North you will find Manggahan (the popular landmark of Casa Alegria). Take the South Luzon Expressway (SLEX) and exit at Sta. Rosa. Turn right upon leaving the Sta. Rosa toll and head straight to Tagaytay City. That road is the Sta. Rosa-Tagaytay National Road, which ends at the rotunda near Tagaytay City Public Market. Turn right to get to the General Emilio Aguinaldo Highway. Look for Ligaya Drive located in front of Tagaytay Elementary School, and keep going straight and you will pass by Balai Taal. When you reach the Sungay North you will find Manggahan (the popular landmark of Casa Alegria). 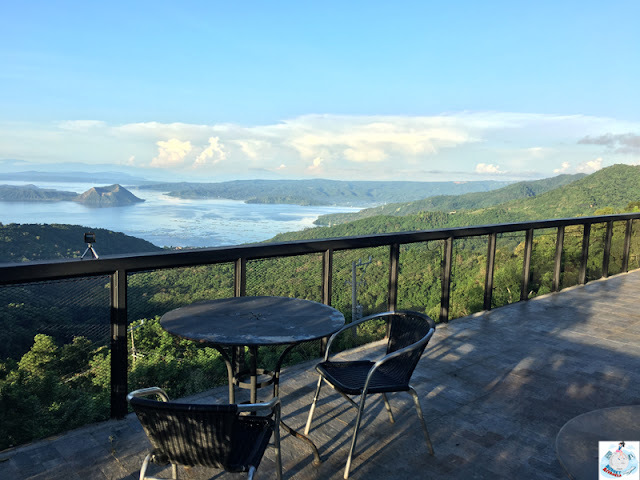 You can also contact Casa Alegria if you’re commuting and taking the bus, so they can schedule Tricycle pick-ups and drop-offs at the Tagaytay Olivarez Bus Stop. A P50 fare (one-way) is charged if you're coming from the bus terminal, and P120 to 130 if you’re coming from the city proper of Tagaytay. </p> wfullscreen mozallowfullscreen allowfullscreen> Wedding Anniversary Getaway at Casa Alegria, Tagaytay from Budget Biyahera on Vimeo. Note: This is a sponsored stay with Casa Alegria. (Budget Biyahera) I do not represent the thoughts, intentions, plans or strategies of the establishment or its owners. All views and opinions shared on this website are solely my own.